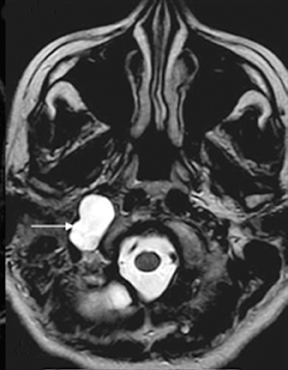 An 18-year-old woman presented with a history of recurrent headaches, which were described as dull aching and persisting for a few hours, mainly on the right side. They were not associated with any obvious cause; there was no history of associated visual disturbances, vertigo, dizziness, earache, nausea, or recurrent upper respiratory tract infections. The general and systemic nervous examination findings were within normal limits. Other sytemic examinations did not reveal any significant abnormality. Ophthalmologic and otorhinolaryngoscopic examinations also did not reveal any abnormalities of note. Routine laboratory investigations were noncontributory. A radiograph of paranasal sinuses and a lateral view of the skull did not reveal any significant abnormality. The patient was referred for a magnetic resonance imaging (MRI) scan of the brain. The scan was performed on a 1.5T MR scanner. A bony defect was observed in the right jugular fossa. Adjacent bones were well scalloped. No obvious destruction of the cortical bone was suspected. There was continuation of the dural meningeal pouch within this defect. It was lining the CSF collection, which appeared hyper-intense on T2-weighted images, and hypo-intense on T1-weighted images. 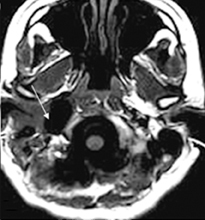 No obvious herniation of the neuroparenchyme or cranial nerve was seen within this out-pouching (Figure 1). 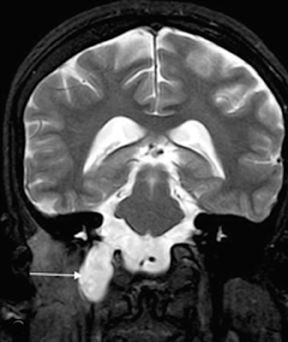 Imaging findings suggested meningocele in the right jugular foramen region. The contents of the right jugular foramen were displaced laterally to this meningocele. It was also extending minimally anteriorly towards the foramen lacerum. Inferiorly, it was bulging into the right parapharyngeal space. The medial margin was seen near the pharyngeal wall. The carotid vessels were also displaced laterally. The right parapharyngeal fat was reduced, compared to that of the left side. The patient was informed about this type of congenital anomaly; she decided not to undergo surgical intervention. She is being treated symptomatically with analgesics. Cephaloceles are congenital herniations of intracranial contents into the skull’s bony defects. These may be meningocele or meningo-encephaloceles (abbreviated as encephalocele), depending on the absence or presence of brain tissue.1 When the lepto-meninges and CSF are herniated without associated herniation of brain parenchyma, it is termed meningocele. Meningoceles of the jugular foramen region are extremely uncommon and difficult to explain by current skull-base cephalocele classifications. Jugular fossa meningoceles may not fit exactly into skull base cephalocele classifications. Meningoceles involving the jugular fossa can present in adulthood and can have better prognosis, especially if they are smaller and not associated with hydrocephalus or other brain/skull anomalies. Possible CSF leak and mass effect at the skull base are important complications. Matuchansky C, Colin R, et al. Cavitation of mesenteric lymph nodes, splenic atrophy, and a flat small intestinal mucosa. Gastoenterology. 1984;87:606-614. Howat A, McPhie J, et al. Cavitation of mesenteric lymph nodes: A rare complication of celiac disease, associated with a poor outcome. Histopathology.1995;27:349-354. Holmes G. Mesenteric lymph node cavitation in coeliac disease. Gut. 1986;27:728-733. Jugular fossa meningocele. Appl Radiol.